Now that you’ve finished taking inventory of your shop, you are fully aware of which tools you need to add to your collection, right? 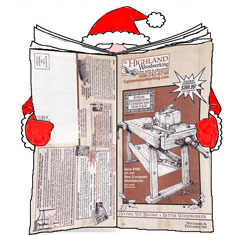 Well that is perfect timing, because Highland Woodworking is having a ridiculous Black Friday sale right now. Lots of great deals, including these and these, and many more. If you are in Atlanta, stop by and check out the store in person. If you aren’t, give a call and talk to the nice people who will be happy to take your order. And if you don’t want to buy just yet, you can still start your wish list and then direct your friends and family to it! Either way, we hope to hear from you soon!